The function of "A dictionary of language acquisition: A comprehensive overview of key terms in first and second language acquisition" is to collect and synthesize the knowledge base that is already well accepted and that has been well researched. Thus, it is a reference guide which offers an authoritative and encyclopedic survey of key terms and concepts in the areas of language acquisition and development. 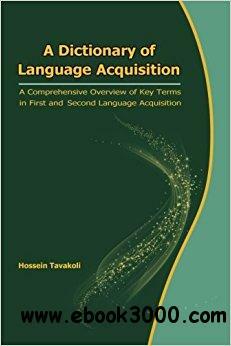 The volume is intended as a resource to elucidate various concepts, issues, approaches, models, and theories of language acquisition in an efficient and accessible style. This book makes use of approximately 1000 alphabetical entries with cross references where necessary. This volume is designed to appeal to undergraduate and graduate students, teachers, lecturers, practitioners, researchers, consultants, and consumers of information across the field of both first and second language acquisition.